Theprivate spaceflight company SpaceX rolled the secondFalcon 9 rocket to its seaside Florida launch pad and pumped propellantintothe booster's fuel tanks Wednesday in a preflight countdown rehearsal. Ateam of launch controllers powered up the two-stagerocketand filled it with kerosene and liquid oxygenpropellants Wednesday afternoon, accomplishing a key exercise of therocket andSpaceX engineers. SpaceXhas reserved Oct. 23 on the Air Force's EasternRange for the Falcon 9 to blast off on its second flight. Its payloadis thefirst functional Dragon capsule, which will make between one and threecircuitsaround Earth and splash down in the Pacific Ocean off the coast ofCalifornia. ASpaceX spokesperson said Wednesday's wetdress rehearsalwassuccessful. 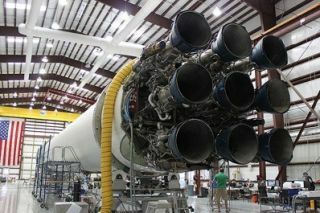 Thecompany plans another practice countdown soon thatwill culminate in a brief ignition of the Falcon's nine Merlin firststageengines, but the spokesperson did not respond to questions on itsschedule. Inthe months leading up to the Falcon 9's debut flightin June, SpaceX conducted two tanking exercises in February and April.A shortengine test firing occurred in March. Nextmonth's launch will be the first time the Dragonspacecraft will fly free in orbit. An instrumented Dragon qualificationunitlaunched June 4 on the Falcon9's first flight,but it stayed attached to the rocket'ssecond stage. SpaceXis developing the Dragon to haul supplies to theInternational Space Station beginning next year, partially replacingthe cargotransportation duties of the space shuttle after its retirement. OrbitalSciences Corp. is working on a robotic freighternamed Cygnus, which is slated for its first flight by the end of 2011.